Herefordshire Cider Route - Wanderlust Camper Co.
Cider with Lula, Amelia or Sally? ​Looking for inspiration and a unique experience for your next break? Then look no further, as this cider route takes in artisan and craft cider makers, quintessential orchards and hills and of course, importantly, tasting. With just a handful of regions for cider making in the country, here at Wanderlust HQ we’re happy to be amid the Herefordshire cider route, which produces over half of the UK cider. The Herefordshire and Wye Valley cider route was put together by Visit Herefordshire with the purpose of showcasing the best of the cider’s the region produces. With their kind permission, we’re highlighting the fantastic cider route here for inspiration of what we think is a fantastic driving tour of Herefordshire and the Wye Valley. Whatsmore, what better way to travel the route than in a campervan so you can pitch up en-route after a day out in the orchards, enjoying the tipple in to the evening. You’ll see campsites included in the interactive map below so help plan your route around the cider and perry makers. Happy planning! 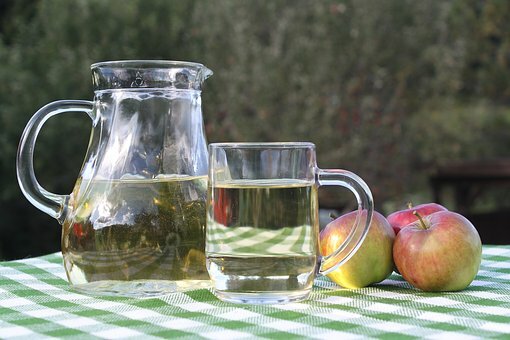 The juice of any variety of apple can be used to make cider, but cider apples are best. The addition of sugar or extra fruit before a second fermentation increases the ethanol content of the resulting beverage. During the 16th & 17th centuries, apple orchards were extensively planted in many regions including Herefordshire, Gloucestershire, and Worcestershire. The majority of the orchard apples were for cider making. New transport links in the forms of canals in the 18th centre helped expand the cider market. or cider. 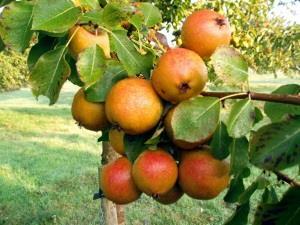 It seemed the art of cider making developed in the 17th and 18th century was lost in the 19th century. however, a book by G.W Radlicffe Cooke from Hellens, Herefordshire - called A Book about Cider and Perry - in 1898 encouraged a revival. There is a cider tradition where farmers and farm workers used to salute the apple trees in a ceremony - this is known as wassailing. Wassail or Wass Hal means Be Thou of Good Health. The date of the wassail varies between Christmas Eve to Twelfth Night from Christmas. 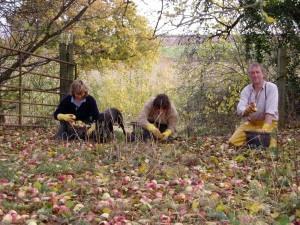 Those taking part raise their glass to the health of the trees, carrying their jug of cider and poured cider around the roots of the trees for a good crop next year. It's traditional to make a lot of noise banging pots and pans. They can be a lot of fun! Keep an eye out for local events in the press. Explore using our interactive map below! Free tasters, fees may apple for tours. Walk leaflet 50p. The Apple County Cider Co is created by husband and wife team Ben and Steph Culpin and who make real cider and perry from their orchards on lush hills overlooking the Monnow valley, near Skenfrith in Monmouthshire. Ben has been making cider since 2008 and he approaches his craft with the same skills and reverence of a traditional wine-maker. A single bitter-sweet apple variety such as Dabinett, Vilberie, and Yarlington Mill, is selected for each cider. When the apples are harvested in the autumn, Ben adds winemakers’ yeast to 100% fresh juice. No other ingredient is needed, apart from patience and time. 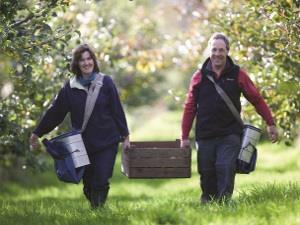 Ben and Steph believe the distinctive flavours of each apple variety develop best through a slow, cold, fermentation. This takes place out in our barn, taking more than half a year to reach fruition. 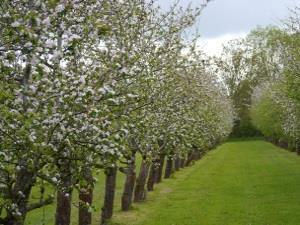 ​Pick up a leaflet of the orchard walk at the cider shop. The walk is 3 miles and takes approximately 2 hours. Parking is available along the Skenfrith to Maypole Road. 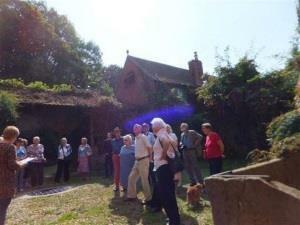 The walk takes in different ages of orchards, rows of blackcurrants and scenic views down the Monnow Valley and beyond. Ben and Steph can organise a picnic for you to enjoy in the orchard, pre booking only. Phone 01600 750835. Ben and Steph invite you to discover a taste of Apple County by visiting the farm for an orchard walk, and tasting at their cellar door, or taking a moment to open up a bottle wherever you are. Directions From A49 Hereford-Leominster, turn right onto A417 after Dinmore hill signposted Gloucester. After 3 miles, turn left to Stoke Prior and Butford Farm is 1.5 miles on the right. Cider has been made at Butford Farm for many a long year – one of their barns boasts a 300 year old cider mill. To carry on this heritage, Janet and Martin Harris planted their first fruit trees in 2000 – a millennium orchard of cider and dessert apples, perry pears, plums and walnut trees which is now in full production. This was supplemented by the acquisition of a mature cider fruit orchard in the next village and the planting of a perry pear orchard, with over 15 varieties, which will supply all their perry pear needs. Butford Organics are certified as organic by the Soil Association and produce their cider and perries with as little intervention as possible – only using wild yeasts and not adding sulphites. A full range of ciders and perries from still draught to sparkling are produced. Every part of the production process is done at the Farm thus ensuring quality control from harvesting to relaxing with that satisfying glass of cider. The regular prestigious competition successes achieved are testament to the benefits of their approach. Visitors can be shown round and tours and tastings arranged. The Farm Shop is open on Fridays and Saturdays and most Bank Holidays. Group visits are welcome including school groups. Research facilities are available by appointment. A programme of events is arranged throughout the year including the International Cider & Perry Competition in May which is open to small and large scale cidermakers (details available on the Cider Museum website). Browse the gift shop with its abundance of cider and perries, along with Hereford Cider Brandy and locally produced gin, vodka and liqueurs as well as a selection of preserves, confectionery, books and individual gift ideas. A tea room is available offering drinks and light snacks. Parking onsite. Try before you buy is available when the shop is open on Friday and Saturday, during your visit to the shop you can also take a walk in the orchard. There is a Cafe on-site called the Cider Barn see: www.the-cider-barn.co.uk to see opening hours or arrange a booking. ** Dunkerton Cider Co are moving the business to Cheltenham, keep checking the website and social media channels for any news**. Opens: Fri/Sat 10:00 - 17:00. Directions: From the A44 Leominster-Kington, at Pembridge turn left by the New Inn and follow signs for the Cider Mill on the left. At Dunkertons, making cider and perry the traditional way always begins with the fruit selected. Their drinks are made from traditional varieties of apples and pears, chosen each Autumn for their particular characteristics. As soon as apples are ripe, which in some years has been as early as September, they are delivered to the Mill in Pembridge or harvested from their very own organic orchards. The fruit is washed, milled to a pulp and then pressed by a belt press. The juice is pumped to shining stainless steel vats for fermentation. A long slow fermentation leads to more interesting flavours, so it can be late May before ciders are ready for racking off. Dunkertons likes to ferment the juice that it presses each year in its single variety form (each type of apple fermented in separate vats). The result is a wonderful selection of single variety cider from which they can craft the blend. Each of the ciders produced are distinctive in their own way and even apples of the same variety from different orchards can taste subtly different and bring something special to the blend. Tasting and blending of the fermented cider happens throughout the year to create delicious cider. Some single varietals ware kept just as they are for the cider enthusiasts like in their Browns, Court Royal and Breakwells Seedling Cider. Bottling of the cider and perry takes place on the premises and some of the cider is pumped across to oak barrels in the converted 16th century barn where you will find a shop and can taste products. Dunkertons strongly believe in sustainable organic farming of the land. They love using organic apples and think that they make the best cider. Come and see what makes cider from organic orchards special. Come and taste cider in the shop and, if the mood strikes you, walk the orchard. There is no charge for the visit. If you are a large group who would like to visit the shop please let us know in advance. There is a Café on site “The Cider Barn” please check that they are open before planning a visit to see us if you would like to book tea or lunch. Tours/tasting: Fees may apply for tastings. ​Directions: From A449 Ledbury - Ross-on-Wye, turn left at staggered crossroads in Much Marcle, follow Dymock Road past Glebe Orchard on the left and turn right up a track a short distance on the right. Established in 1994, Gregg's Pit make craft cider and perry from 100% juice of vintage fruit harvested from traditional standard Herefordshire orchards. 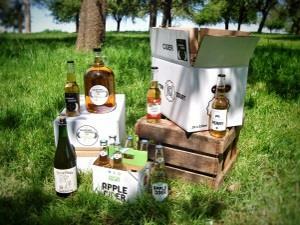 The product range includes draught, bottle conditioned, and in-bottle fermented ciders and perries. They make in season, typically from late September to early December, with what nature provides – that’s just 100% fresh pressed juice from named varieties of sun-ripened fruit and wild yeasts. Gregg's Pit don’t use concentrates, corn syrup, artificial sweeteners or other ingredients allowed by the legal definition of “cider”. They harvest their own fruit from wide spaced trees in traditional standard orchards, sometimes a single lonely old tree or a row of trees. They’re unsprayed, rich in birds and bugs, not like the many pesticide sprays and sterile strips typical of more intensively managed bush orchards. Gregg's Pit seek out named varieties with natural fruit sugar, tannin and acidity (rarely found in a single variety), and blend different varieties with the required vintage qualities each year. Diversity in characteristic fruit flavours and alcohol levels is valued, meaning products are gloriously inconsistent and are made a virtue of this - as part of their USP! Directions: From B4348 Hay-on-Wye-Peterchurch/Ross-on-Wye, after Vowchurch turn right onto the B4347 signposted Abbey Dore. Moorhamption Farm is a new miles on the right. We have been making our award-winning cider and perry commercially for 25 years now at our family-run farm on the outskirts of Abbey Dore in the Golden Valley. Before that, cider and perry was made at our farm just for the family and farm workers, the orchards we still use today are marked on the 1831 map of the area so we have a long tradition of cidermaking at Moorhampton Farm. The origins of our historic farm go as far back as 1147 when it was grange of the nearby Abbey. Gwatkin Cider has featured on many television programmes over the years including Great British Railway Journeys with Michael Portillo as well as Drink to Britain with Oz Clarke and James May. Denis Gwatkin has won many awards over the years for his cider and perry, including CAMRA Cider and Perry of the Year and International Cidermaker of the Year. Our cider and perry are made in the same traditional manner as ever before with natural yeasts spontaneously fermenting the pressed juice into cider and perry. Unlike other makers we do not use sulphites to kill off the natural yeast. Our farm shop is open every day and features our entire range of ciders and perries, in bottles and on draught with quantities available from one pint to 35 pint containers in stock. We are located about 15 minutes drive away from Hereford City Centre, 25 minutes drive from Abergavenny and 20 minutes drive away from Hay-on-Wye. We also host a three-day music festival called Down on the Farm every August, which features around 30 bands over two stages with camping in our extensive orchards and pastures, together with home cooking. If you are unable to visit us at the farm then you can catch us at one of the hundred shows we do across the country from game fairs to food festivals, alternatively our award-winning ciders and perries are available to buy online from our website. We are fully licensed at our farm and can provide facilities for private parties, ranging from a dozen to a few hundred people. We have a small tap room and are able to expand into marquees and a nearby barn for birthday parties, work do’s etc. We also have a dedicated catering wagon on-site and can cater for any event with home-made burgers and sausages being very popular. Tours/tastingTours and groups welcome by arrangement. Directions: From A49 Hereford-Leominster, take the first exit at the Leominster roundabout signposted Leominster and Newton. Newton Court is not too far from Herefordshire’s largest market town, Leominster (say Lem-ster or the locals will point and stare!) The River Lugg makes its way past the farm and then goes on to Hampton Court. The cidery is part of a 157 acre certified organic farm with 30 acres of cider apple and perry pear orchards. The heavy Herefordshire red clay soil and climate make it a great place to grow fine cider fruit and we are proud to make award winning ciders and perry’s using fruit from our own orchards or from friends in the county. We pick, press, ferment and bottle everything ourselves and we squeezed just over 45 tonnes of fruit in 2015. You are very welcome to visit, walk through the orchards, taste some cider and see our ideals in practice – real apples, real cider made by real people. It’s where our very own Grasping Goose Cider is milled, pressed and fermented. Also try “Leominster Champagne” – our First Press Apple cider! We welcome coach tours and larger parties by prior arrangement and will, where possible, happily tailor visits to suit you and your group. We can also provide light lunches and soft drinks in the cidery for visiting groups (again, by prior arrangement). ​and continue to The Old Hop Kilns. Go to any cider & perry competition and it’s likely that Tom Oliver will be on the podium. He has a busy life juggling quality cider and perry alongside his other day job – tour manager for a variety of bands, from the Pretenders through to the Proclaimers. Apples have been grown in Ocle Pychard for centuries and on the family farm for generations until his grandfather decided their time had passed and switched to hops. Tom wasn’t convinced and when hops met their demise in the late 1990s, set about rebuilding the orchards pretty much from scratch. Located in the cider/perry heartland of Herefordshire and working with like-minded farmers and growers in the locality, Tom now has dozens of different varieties of cider apples and perry pears to call upon and it is perry that he has become particularly well known for. 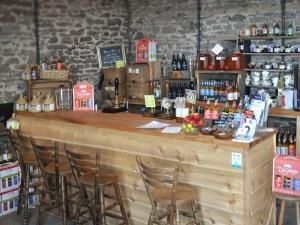 Tours/tasting: Free tastings at the Tree Counties Cider Shop. ​ can be arranged by appointment. Directions: From A438 Hereford-Brecon, continue at the Brecon turn onto the A4111 towards Eardisley and immediately right again onto the A4112 towards Leominster. Great Parton is a short distance on the right. Visit our Orgasmic Cider Company shop and try before you buy from our selection of draught and bottled traditional Ciders and Perry’s, all grown and produced by the Layton Family at Great Parton Farm. Visit our restored cider press and licensed orchard area for a relaxing drink amongst the trees. New to try and buy: quenching homegrown Parton Apple Juice, plus a fine selection of locally made fruit liqueurs from Jo Hilditch and Monkhide, and apple blossom honey from hives in the Orgasmic Cider Co. Orchards. Shop open Midday – 5pm Saturdays and bank holiday Fridays and Mondays. Weekdays by appointment only so call ahead to avoid disappointment. This summer at The Orgasmic Cider Company we are offering exclusive group tours around our cider house and orchards here in the heart of rural Herefordshire. We’ll show you around and talk you through our whole cider making process from orchard to bottle, then introduce you to the finished products. Alcohol sampling included for all 18 years and over. For more information or to book a group tour please call or e-mail us on the details above. Reservations essential. 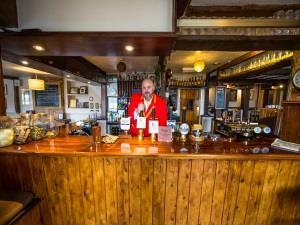 Tours/tasting: We welcome pre-booked groups of 4 or more to our Cider Shop at the Yew Tree Inn. £15 per head (1 to 2 hours) including a walk through the cider and perry pear orchards, talk about production and a tutored tasting. Choose a 50cl bottle of cider to take home. A great stag, hen or friends experience. Opens: Cider Shop open daily 12 noon to 6 pm, Yew Tree Inn daily from 12 noon. The Ross-on-Wye Cider and Perry Company is based at Broome Farm in Peterstow where cider and perry has been made by the Johnson family since 1930. We are delighted to also have a great Cider Shop at The Yew Tree Inn at Peterstow. There are now over 100 varieties of apples and 30 varieties of perry pears growing on the farm enabling the creation of award winning single varieties and individual blends. 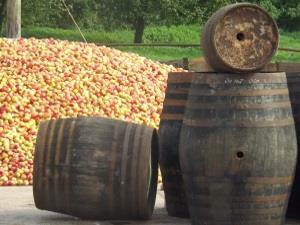 The cider and perry is produced purely and simply in the traditional way. The purity comes from using only whole juice and the simplicity from allowing the juice to ferment with it’s own natural yeasts. 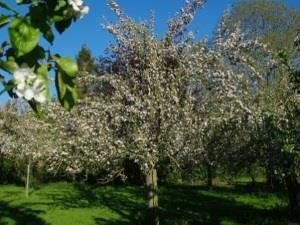 “Broome Farm lies in the heart of the Herefordshire cider making district. The farm is mkore than 400 years old and has been making cider for almost all that time and recently with considerable success; in the past few year Mike Johnson’s ciders have won several national awards”. “It’s a revelation, more like fine wine tasting – pears may be for your heirs but perry is there for the drinking”. You are also welcome to take a stroll around the Broome Farm orchards and say hello to our lovely alpacas. During the summer months the cider barn hosts a variety of events including our annual Cider Festival – check out www.rosscider.com for details. In 2014 the Ross-on-Wye Cider and Perry Company took on the tenancy of The Yew Tree Inn in Peterstow where the Cider Shop is now located for sales of draught cider and perry straight from the barrels. 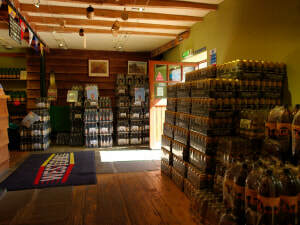 There is also a large selection of bottled cider and perry available. Opens: Mon-Fri Lunch 12pm-3pm, food 12pm-2pm, Mon-Fri Eve 6pm-11pm, food 6pm-9pm. Directions: From B4224 Hereford-Fownhope, turn left between Moon Inn and the bridge, signposted Woolhope. At the T junction in Woolhope, turn left and The Crown is on the left. The tours take up to an hour and a half and this includes tasting of ciders and perries in the shop for adults. Booking recommended. Directions: We are situated in Much Marcle, just off the A449. At Much Marcle Cross Roads (with the old Garage and Walwyn Arms), turn right from Ledbury or left from Ross-on-Wye. Westons is about ½ mile up the road and is clearly signposted. Nestled amongst acres of apple and perry pear orchards, our 400 year old farmhouse, The Bounds, is the centre piece to a truly unique day out. Open 7 days a week, visitors of all ages are invited to discover the secrets of traditional cider making by joining one of our daily guided mill tours. CONTACT US ON 01531 660108. Hear how cider is produced from the planting of the orchards to the moment it is poured. During your visit, stroll through our award-winning Henry Weston Courtyard Garden and into a converted seventeenth century cowshed to see our magnificent cider bottle collections, which is proudly one of the largest in the world. Adults are invited to sample our wide selection of ciders and perries on offer in our onsite cider shop. For those looking for a delicious meal made from fresh Herefordshire produce, a piece of homemade cake or simply a cup of tea, you will be spoilt for choice at The Scrumpy House Restaurant and Bottle Museum Tea Rooms. Whether it's a refreshing pint of Stowford Press in the summer sunshine, or a warming mug of mulled cider by our open fire, a visit to Westons Cider Mill is perfect all year round. Experience the unique history of the Westons family, learn how Henry Weston founded the business in 1880 and how this independent and family owned cider and perry maker has developed into the one of the country's finest producers of quality ciders and perries. Step back in time as you experience the tranquil and fragrant vat shed, housing our historic oak vats, some nearly 200 years old and all still used. A tour of Westons Cider Mill offers a truly unique back-stage pass to the traditional and very English art of cider making. Directions: Rural Concierge is located in the Butter Market, in High Town, Hereford. So if you are travelling in a group, club or individually, your Rural Concierge can arrange day trips, themed tours, bespoke itineraries as well as overnight stays. Booking a fully organised excorted trip means you can have more time to enjoy a great day out with everything arranged for you from start to finish. From coaches to chauffeur-driven cars, from local bus and train services to bicycle hire or even a helicopter, Rural Concierge can arrange days to suit any budget or experience!